4.5 out of 5 stars based on 276 votes. Obtaining a second passport could be one of the best investments you’ll ever make. It offers the lifelong benefit of having more options for living, traveling, doing business, investing, and potentially even saving you a fortune in taxes. And buying a passport through a legitimate citizenship by investment program is one of the quickest ways to get one. Right now, in 2018, may also be the best time to buy a second passport, because several citizenship by investment programs have gone ON SALE due to the devastating effects of the 2017 hurricane season (more on that below). You’ll find everything you need to know in this article-- Whether you are looking for the best, the cheapest, a European or a Caribbean citizenship and passport. Is Citizenship By Investment Right For You? Citizenship by investment is exactly what it sounds like: foreigners invest a certain sum of money in a country in exchange for citizenship and a passport. Depending on the country, the investment amount can vary from just over $100,000 (Antigua) to over $2.5 million (Cyprus), plus applicable processing and due diligence fees. Think of citizenship by investment as your shortcut path to a second passport. But, you’ve got to be careful: Some of these shortcuts are MUCH better options than others. When you’re parting with a couple hundred thousand or up to a couple million dollars, you need to know exactly what you’re getting into. For example, although these programs are collectively referred to as “investments”, in many cases you don’t actually get back your principal. It’s more accurate to refer to some programs as “citizenship by donation”. In other cases, you can get some or most of your principal back and potentially even generate an investment return. Some countries’ passports only allow visa-free travel to a few dozen countries, which excludes North America, Europe, Australia, etc. Other countries’ passports are good for visa-free travel to over 170 countries and include nearly all of the developed nations, ranking them among the highest quality passports in the world. Ancestry: If you are lucky enough to have parents, grandparents or even great-grandparents from the right country, you may already be eligible for a second citizenship by descent. Time: After you obtain permanent residency in a country you can become eligible for a second passport through naturalization. This option usually takes several years, but the advantage is that anyone can do this. And in some countries you don’t even have to spend any time there. Money: And the final option is taking advantage of a citizenship by investment program to legally buy a nationality and thus acquire a second passport. Instant citizenship is just that - you invest in a government fund, real estate property, approved business or government bonds and shortly after the country processes your application, you receive a second passport. We mention gorgeous locations, because the countries offering instant citizenship are mostly in the Caribbean region. But, while each Caribbean citizenship by investment program grants visa-free access to the European Union, the quality of their passports - defined as the number of visa-free countries you can visit - isn’t as high as economic citizenship programs in Europe. Another option is to invest in Europe and get European residency that can eventually lead to European citizenship. These European Union programs offer a higher-quality second passport, but you’ll have to pay more for it. And you’ll have to wait-- oftentimes five years or more. These programs are known as Golden Visas. A Golden Visa is not the same as citizenship by investment. It is residency (which can lead to citizenship). Malta, Cyprus and Portugal all have Golden Visas that grant residency and ultimately can confer citizenship... if you meet the country’s requirements. But in this article we’ll be focusing only on instant citizenship programs that grant citizenship in 12 months or less - much shorter time frames than the Golden Visa options. Here at Sovereign Man we believe that a second passport makes sense for everyone. We cannot overstate the benefits of this. Having a second passport is something we call the ultimate insurance policy. With a second citizenship and passport you are no longer beholden to one nation. No single government has exclusive authority you. Ultimately, a second passport is all about options – the more options you have for you and your family, the more freedom you will experience. And although obtaining a second citizenship and passport makes sense for everyone, paying hundreds of thousands of dollars does not make sense for everyone. Economic citizenship is just one of four ways to get a second passport. And before you rush off to buy a second passport, we encourage you to first consider other options we’ll discuss here that may be a better fit. Whether citizenship by investment is the right option for you, depends on the amount of wealth you’ll be protecting with it. Just as you wouldn’t spend $10,000 on a car insurance policy that covers a $40,000 SUV, it doesn’t make sense to spend $250,000 on a passport designed to safeguard total assets that are worth, say, $1 million or less. The first alternative everyone should look at is their family tree. For example, if you have parents, grandparents (and in some cases even great-grandparents) from Italy, Ireland, Greece or several other countries, you may be eligible for a second passport through citizenship by descent. This is called jus sanguinis - the right of blood - and many countries around the world recognize its citizens’ ancestors as their own. And if you’re eligible for citizenship by descent, your children can also get a second passport. So, a little bit of your effort and time turns into a generational gift at a fraction of the price you would pay for an economic citizenship. To get a better idea of how this process works, you can download a free in-depth intelligence report on How To Get an Italian Passport & Citizenship By Descent here. But not everyone is blessed with the ancestral line that grants them a second passport. Another option to explore is a foreign residency. Sure, a foreign residency doesn’t immediately grant you a second passport. But, a foreign residency comes with plenty of upside. You’ve still got a place to go no matter what happens in your home country. And you can dramatically reduce your taxes. Residing in a low tax country could mean significant tax savings. Plus, if you’re an American, you can take advantage of the Foreign Earned Income Exclusion Act and receive up to $104,100 annually in tax-free income. And some countries have a territorial taxation system, meaning you only pay taxes on locally generated income, not your global income. Foreign residency also means you’re on the path to naturalization. After a few years of residency abroad (and assuming you meet all the country’s other requirements), you can apply for citizenship and a second passport. 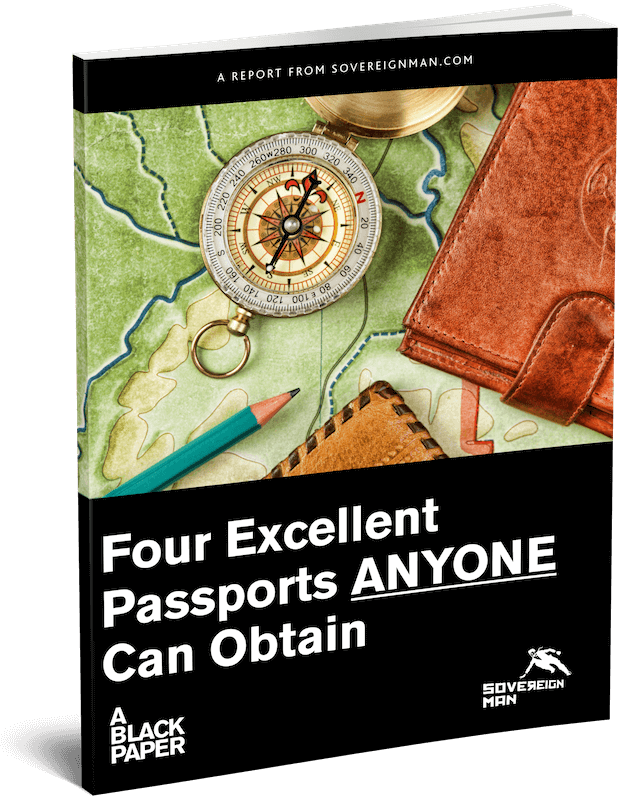 We are writing in more detail about one such option in our free guide on The Four Passports ANYONE Can Obtain (Including a European one). The US is one of just two countries in the world that continue to tax citizens on their worldwide income-- even if they don’t reside in their home country anymore. For example, if a British citizen moves to Hong Kong, he’ll only be liable to the taxes of Hong Kong. But if an American citizen does the same, he’ll have to pay taxes to both the Hong Kong and US governments if he is earning more than $104,100 in salary. And he will have to keep paying taxes to the IRS on the first dollar of investment income, no exemptions here. If you are in this situation, the only way for you to completely escape the US tax system, is to renounce your US citizenship. And to renounce it, you’ll first have to get a second citizenship and passport. If you are a very high-income earner, citizenship by investment could certainly make financial sense for you. But before you renounce your citizenship, you should look at alternative tax reduction strategies. The US tax code offers a lot of opportunities to legally reduce your tax liability without resorting to renunciation. Foreign residency is an option for high income earners, too. Again, the Foreign Earned Income Exclusion (FEIE) Act in 2018 allows US expatriates to earn $104,100 annually tax-free. And US taxpayers living abroad qualify for the Foreign Housing Exclusion. The limit on housing expenses varies depending on the destination country (the IRS allows you to deduct more in Japan, than say in Nicaragua), but usually it amounts to another $15,000-$20,000. 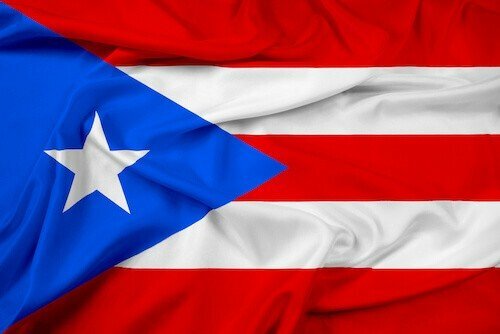 Another option are Puerto Rico’s amazing tax incentives. A few years ago the government there passed a number of tax incentive laws, the most famous of which are known as “Act 20” and “Act 22”. So, if you are an investor or business owner, you can use this strategy to slash your taxes to a negligible amount without giving up your citizenship. 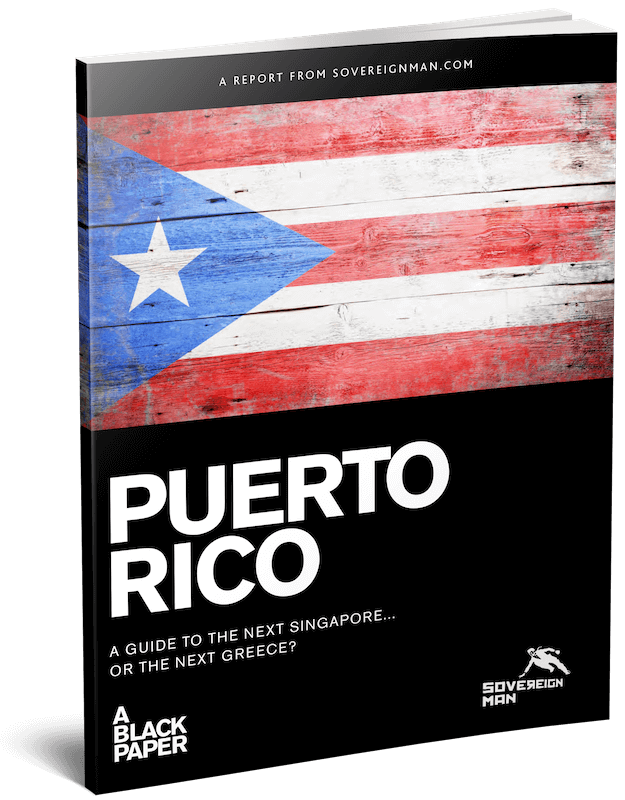 We also have a free report on Puerto Rico that you can download here. 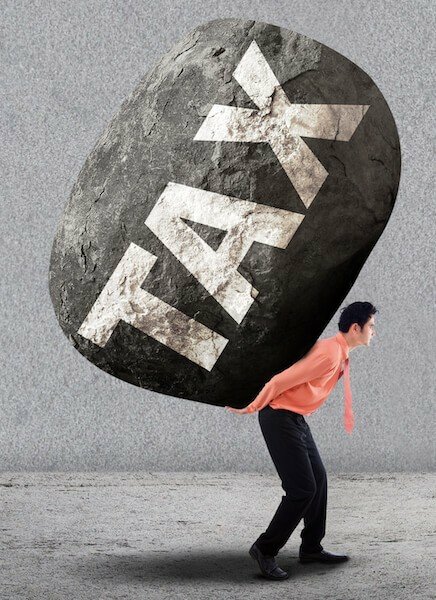 There are many other fantastic, legal tax reduction strategies-- especially if you own a business. But if none of these options are suitable for you, then maybe a second citizenship by investment is indeed your route to renounce your US citizenship and enjoy enormous tax savings. This strategy would, for example, make sense for financial professionals who are employees working overseas and earn significantly more than the Foreign Earned Income Exclusion (FEIE) limit. If you work abroad and make millions each year, paying a few hundred thousand for a citizenship by investment program is certainly in the cards. Also, if you receive a large investment (not earned) income, you should consider citizenship by investment too, as FEIE does not apply to investment income. Before snapping up a second passport and renouncing your US citizenship, always consider the travel inconveniences of a passport that’s not as high quality as an American one though. Getting citizenship by descent should still be the first option you look at, because you may be eligible for a very high-quality European passport that could be even better than your current US passport. And consider subscribing to our free newsletter, Notes From The Field, where we share advice on how to make more money, keep more of it and protect it all from frivolous lawsuits and overreaching governments. In Notes you will also learn about the latest developments in the field of economic citizenships and citizenships by descent. Are you a High-Net-Worth Individual? Then perhaps our highest-end membership, Total Access, could be right for you. Inside members get access to private opportunities and other information that are just too sensitive to put into print. You also get first access to our ultra-secure private bank, exclusive private equity investment deals and events where you can network with other like-minded members. As a Total Access member, you’ll be on my team, and I’ll be on yours. This means you'll get direct access to me, to my trusted inner circle and much more. Click here to learn more about Total Access. And this brings us to a third category: holders of “bad” passports. If your passport doesn’t allow visa-free travel to North America or Europe, you’re severely limited in your ability to conduct business in many of the world’s largest economies. And if you can’t visit North America AND Europe visa-free, your restrictions are even more severe. Take Saudi Arabia’s citizens, for example. Its citizens cannot travel visa-free to the US, China, Japan, Germany, France, the United Kingdom and India… shutting them out of these countries with a Gross Domestic Product (GDP) of $2 trillion or more. Australia, Russia and most of South America are also also off-limits to Saudis unless they obtain a visa. So, it’s no wonder that most economic citizenship applicants come from a few regions: the Middle East, the ex-Soviet block and China – the countries whose passports do not allow visa-free travel to the so-called developed world. Citizens of all these countries usually lived through some catastrophic events in their country’s history and remember them well. They also generally tend to distrust their governments. And as more citizens gain wealth, they want to diversify their wealth around the world. Increasing economic crackdowns and outright capital controls in places like China are spurring individuals to seek second passport solutions in Europe and the Caribbean. Whether it’s Caribbean economic citizenship programs that grant visa-free travel to the European Union for business, work or travel, or European citizenship by investment programs, these options make a lot of sense for those disconnected from the rest of the world and the economic opportunities presented there. But, for “bad” passport holders, before you buy a passport, first consider and weigh other options. One such option is to pursue a points-based immigration visa. This type of visa grants residency to skilled immigrants - and especially those with skills in high-demand fields such as engineering or medicine. It’s offered by Australia, New Zealand and Canada. If you qualify, you will be able to immigrate to one of these countries. And after living there for approximately five years, apply for a citizenship. And of course you may be eligible for citizenship by descent as described earlier. If neither option works for you, then citizenship by investment is worthy of consideration though. Other readers gave this article an average rating of 4.5 stars. As far as which is the absolute “best” citizenship by investment option, that will depend on a number of subjective factors: one’s budget, how you value the specific investment deal offered by the second citizenship country (donation versus the potential for an investment return) and comfort in the country. This factor is simple and straightforward. For those who wish to renounce their original citizenship, this is the key factor to keep in mind. A passport from one of these countries includes visa-free access to most of the developed world and key parts of the developing world, including most of southeast Asia (for manufacturing and trade opportunities). Find out inside our Download our Citizenship By Investment Comparison Sheet where you’ll see all the countries you can (and can’t) enter visa-free with each passport. Avoid overpaying for a passport that doesn’t provide significantly more value with this comparison sheet. This is the number of visa-free countries its holders can visit with the second passport that they cannot visit with their first passport. For those who intend to keep their original citizenship (and their passport), this second factor is the one to consider. When combining your two passports, you could unlock many more opportunities for business, work and travel. For example, someone who’s from the US would benefit from a European passport that gives him or her unfettered access to the European continent. This individual could reside in France, incorporate and run a business in low-tax Ireland and enjoy passport-free travel in 26 countries (Europe’s Schengen Area). But someone who already has a European passport would not benefit as much from the second passport complement effect. Let’s return to Germany, for example. A German businessman or woman can travel freely to 177 nations. They can structure a manufacturing business in southeast Asia and visit as often as they’d like. While this individual could benefit from diversifying internationally, the passport itself from St. Kitts & Nevis is unlikely to unlock more business opportunities. First, what’s the passport’s reputation? It’s possible for a government to opt not to honor one’s other passports if they don’t believe that they are based on legitimate citizenship. This is rare, but has happened in extreme circumstances. With a top tier passport from Malta, your chances of ever encountering this issue are rare. Next, how well do you blend with your second passport? Meaning: Does it look suspicious if you have a passport from that country? Immigration officers are not immune from racism, and may not trust your document if you vary too greatly from the local norm. There are some world melting pots like Brazil where no one will think twice about someone claiming citizenship. The third consideration is taxes. One great benefit of living or having residency abroad can be the ability to minimize your tax burden. But, if you’re not careful, you could become liable for more taxes. For example, some foreigners in the US are opting not to pursue passport because it then subjects them to taxation on their worldwide income for the rest of their lives. Be sure to check out what the tax requirements for residents and citizens are. Finally, consider military service obligations that come with a new citizenship. In some countries, all male citizens of a certain age are required to fulfill military service. The requirements may range from a few weeks of basic training to a few years of active duty. So, while these are certainly objective measures, valuing a passport and citizenship still comes down to your individual situation - are you looking to renounce your citizenship, or do you want to retain your citizenship and take advantage of your second passport? This brings us to the types of investment options available and the discussion of where to buy a passport, or which countries offer citizenship by investment… one of which may stand out as the right one for you and your family. Most citizenship by investment countries offer two or more options to purchase a passport. One of these is usually a donation option, and the other is an investment in real estate or a local business. And don’t think of the government bond option as an investment. If your capital is locked in an interest-free account for a predetermined time, this isn’t an investment; it’s a loan that’s returned several years later. Governments needing capital will exchange citizenship for money. These governments usually spend money collected through the funds on education, healthcare or infrastructure. Technically it is a citizenship by "donation" option since you will not get your contribution back. That’s an obvious downside. But compared to these other investment options, a donation to a government fund oftentimes lands you a cheaper passport. The immigration through investment in real estate option usually requires a much larger contribution and a hefty government application fee, ranging from $25,000 to $50,000… or more. And you’re often investing in an overpriced, government-approved luxurious real estate development or hotel project. But because you’re buying a real asset, you can likely get at least some of the money back if you decide to sell. And if the local real estate market booms, you can do even better. After a certain period (usually 3 to 7 years), countries usually allow investors to sell the property. In the meantime, if you don’t live in your new home full-time, you can rent out the property for some investment income. This investment option is usually much more expensive than investing in real estate. And some Caribbean countries offering citizenship by investment don’t allow investments in local businesses. But, for countries like Antigua that allow investments in government-approved businesses, you’ve got a few options across industries to potentially generate a return. However, only consider this investment option if you really know what you are doing. You may be investing in a business that will go under in a couple of years. And your “investment” will suddenly become a very expensive “donation”. Fewer citizenship by investment countries offer the government bond option, which locks your investment in an interest-free account for 5 years. While this may be another option to obtain citizenship and a passport, consider the downsides: First, there’s the opportunity costs. Instead of an investment in a cash-flowing (albeit, overpriced) rental property or a business, your money just sits in the government’s coffers, offering no return. And second, you must consider the counter-party risk that the government poses - will it stay solvent to return your capital after the required hold period is over? For both of these reasons, government bond purchases in exchange for a passport isn’t the best investment option in our opinion. There are almost a dozen explicit citizenship by investment programs in the world today - 5 in the Caribbean, 4 in Europe, and a couple others spread out across the globe. We’ll present all options with the total cost, including government fees, for a family of four-- with two children between 12 and 15 years of age. You can choose to work with a world-famous service provider and pay tens of thousands of dollars in fees, or work with a much smaller firm and pay a fraction of that. The end result, however, will generally be the same - second citizenship and a passport. The best passport, skip ahead to Austria. The cheapest overall option, skip ahead to Comoros (which we can’t recommend…). The best value option, skip ahead to Saint Lucia if you’re a single applicant or to Antigua and Barbuda if you are a family (These are the cheapest options we can actually recommend…). The best value in Europe, skip ahead to Malta. The most famous program, skip ahead to St. Kitts & Nevis. Aside from the cheapest, best value and most famous programs, where do you buy a passport? And for the time being, there’s a fire sale on some of the Caribbean passports. After the 2017 hurricanes, many countries in the Caribbean realize they need a lot of money for rebuilding. The best way to attract new clients? Slash prices. Saint Kitts introduced a brand new discounted donation option that saves single applicants $100,000 and families of four just over $100,000. Grenada reduced its donation option from $200,000 to $150,000 (plus fees) for a single applicant. Antigua and Barbuda slashed its donations minimum in half. And Dominica cut its government fees 50% even before the storms. In other words, anyone shopping for an economic citizenship can save a lot of money now. There’s the cheapest economic citizenship program (Comoros)… and then there are the cheapest citizenship by investment programs that we can actually recommend. To determine the best citizenship by investment value, we first reviewed each country’s lowest-cost investment option (donation), then divided this cost by the number of visa-free countries its passport allows. And since it’s possible to generate rental income, we also reviewed each country’s real estate investment option and, again, divided this cost by the number of visa-free countries its passport allows. First is the cheapest avenue, a donation to their National Economic Fund (NEF). A single applicant will spend $109,500 all-in for this second passport route. And a family of four will spend $207,500 all-in. The government bond option requires investors to keep bonds for at least five years. These bonds don’t pay any interest and are expensive - $550,000 for a family of four (and $617,500 in all-in costs). You can get more details in our in-depth article on St. Lucia citizenship by investment and on Saint Lucia’s official citizenship by investment website. The National Development Fund is the country’s cheapest passport option. In exchange for a $100,000 donation (with another $40,000 in fees), individuals get a second passport good for visa-free travel to 140 countries, including the EU’s Schengen area, the United Kingdom and Brazil. At $1,000 per visa-free country, Antigua and Barbuda’s it is the best value for families compared to all other options. You can get more details in our in-depth article on Antigua & Barbuda citizenship by investment and on the government's official citizenship by investment website. Despite the attractive price, we currently recommend you skip the Dominican passport option. Many industry players we respect consider the reputation of Dominica’s program to be subpar. Dominica has been known to accept clients with less than pristine reputation that other countries refuse to work with. They might have fixed the problem already, but to be on a safe side, we encourage you to consider other options instead. Dominica’s real estate citizenship by investment option requires investors to purchase a $200,000 property. Government, processing and due diligence fees bring the total for a single applicant to $212,500 and a family of four to $247,500. Dominica also offers a donation option, through their Economic Diversification Fund (EDF). A family of four will donate $200,000 to the EDF, plus $12,500 in fees. In exchange for the real estate investment or donation, investors receive a second passport that allows visa-free travel to 122 countries, including the Schengen area, the United Kingdom and Brazil. You can get more details on Dominica’s official citizenship by investment website. After a 33 year-long history of leading the field of economic citizenships, St. Kitts’ program has earned a stellar reputation. St. Kitts has traditionally offered the Sugar Industry Diversification Fund (SIDF) and real estate investment options. Starting in late 2017, St. Kitts introduced a new, temporary donation option, the Hurricane Relief Fund. And St. Kitts officials have decided to transform the Hurricane Relief Fund into a permanent donation option. This new option is called the Sustainable Growth Fund. This means that, all-in costs for a single applicant on the donation side now run $157,500. And for a family of four, the St. Kitts donation all-in costs are now $210,500. On the real estate side, you may invest in a pre-approved real estate project, which includes hotel shares, villas, and condominium units. A $400,000 minimum purchase, plus government and processing fees equal an all-in investment of about $535,000 (again, for a family of four). After five years, you can sell your real estate. In either case - donation or real estate - you’ll receive a passport that has visa-free access to 141 countries. 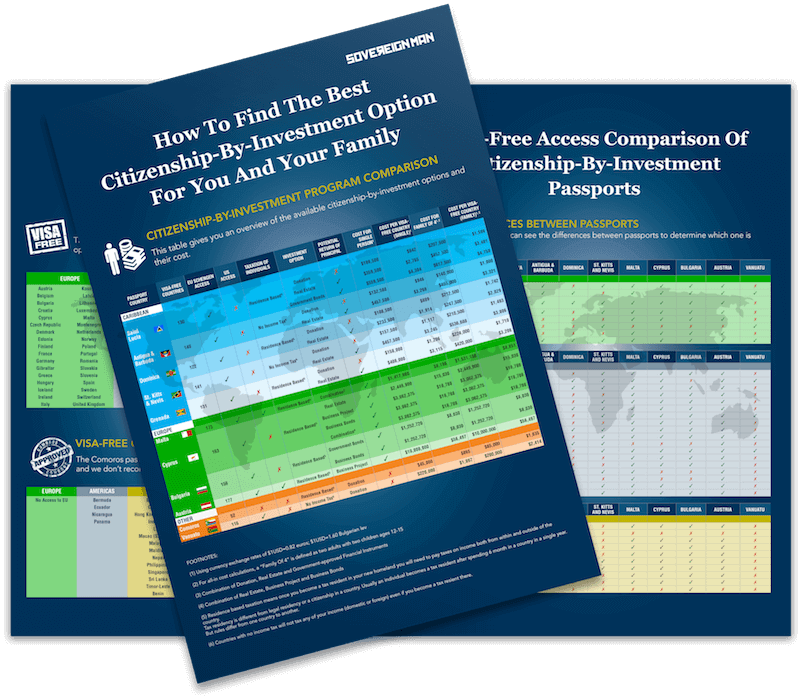 Download our Citizenship By Investment Comparison Sheet to see all the visa-free countries each passport offers and how they differ. This will help you decide whether the extra cost for a certain passport is worth it for you. You can get more details in our in-depth article on St. Kitts & Nevis citizenship by investment and on the government's official citizenship by investment website. Although Grenada’s citizenship by investment program just started in 2013, it has risen to be a serious player amongst the field. Investors have a choice between the National Transformation Fund (NTF) - the donation option - or the real estate option. A family of four (again, with two children from 12-15 years of age) will contribute $200,000 to the NTF. With fees, the total is $224,000. Or, a $350,000 real estate investment (plus $70,000 in government, application, processing and due diligence fees) qualifies you for a second passport. Applicants must keep the property for at least three years. Grenada’s passport offers visa-free travel to 131 countries. Besides Schengen, the UK, and Brazil, it allows its citizens visa-free access to China. It may also help get a foot into the US, as Grenada is part of the E-2 Investor visa treaty. You can get more details on Grenada’s official citizenship by investment website. Does "More Visa-Free Countries" Equal "Better Passport"? The answer is "it depends"... It depends on which additional countries you get and how likely you are to visit them. For example, a passport may offer 10 additional countries, but also cost tens of thousands of dollars more... We encourage you to think it through carefully and consider whether these additional visa-free countries are worth the cost. To help you do this, we've created a detailed Citizenship By Investment Comparison Sheet that shows you the differences in visa-free travel between all citizenship-by-investment passports. Curious about other ways you can get a European passport? Check out our article on the 3 ways to get a European citizenship and excellent second passport article. Malta is home to the first European Union-approved citizenship by investment program. Invest at least €150,000 in government-approved financial instruments – stocks, bonds, etc. All-in, your total is €1,250,000. You’ll secure Maltese residency first. Then, within 12 months of maintaining Maltese residency, you’ll obtain citizenship and a passport for visa-free travel to 173 countries. This is a very competitive price tag for EU citizenship. You can get more details on Malta’s official citizenship by investment website. Citizenship by investment in Cyprus gives you investment options… but at €2,000,000, it comes at a heftier price than Malta. You can invest in real estate or infrastructure, a Cypriot business that employs five citizens, bonds or securities of a Cypriot business licensed by the Securities and Exchange Commission or a combination of these choices. Regardless of your choice, you must purchase a residence valued at €500,000. For applicants who choose the real estate option, this residence can be included in the €2,000,000 overall investment. For investors who choose the other options, the real estate minimum is on top of their €2,000,000 investment. Good news - there’s no residency waiting period to obtain a passport. Within a few months, you’ll have your passport in hand. A Cypriot passport grants visa-free access to 163 countries. You can get more details on Cyprus’ official citizenship by investment page. Like Malta, Bulgaria’s citizenship by investment program begins with residency. Upon approval and receipt of the investment, Bulgaria issues the investor permanent residency. And after one year of permanent residency (which doesn’t require a minimum time in the country), you can pursue the fast track citizenship path. You’ll need to again invest 1,000,000 Bulgarian lev into government bonds or into a Bulgarian company that’s carrying out a priority investment project, as defined in Bulgaria’s Investment Promotion Act. Bulgaria’s passport allows visa-free travel to 156 countries, including Australia, several countries in southeast Asia, Japan, most of South America and Canada… but not the US. You can get more details on Bulgaria’s official citizenship by investment page. And finally, the Austrian citizenship by investment program, which is the most restrictive. The rules are vague. In addition to the large contribution (around €10 million), you need to secure patronage of a high-ranking local politician who will petition before the government. If you want to go this route, the passport payoff is certainly there. An Austrian passport grants visa-free travel to 177 countries, ranking it at the very top of most valued passports. Unlike most programs, Austria’s is not codified in law. Instead it is taking advantage of Article 10 (6) of the Austrian Citizenship Act that states that the government can reward foreign persons with citizenship in the event of extraordinary merit. Because of the large cost and the complicated process, you may want to consider Malta instead, which is our European best value pick. The cheapest passport in the world is from Comoros, an island off Africa’s east coast. A donation of $85,000 grants your entire family a passport for visa-free travel to 52 countries, with none of the developed world included. If you are applying as a single, the price goes down to approximately $45,000. Comoros’ citizenship by investment program began in 2008. And due to lack of a positive track record, we cannot recommend this cheapest second passport program. Instead, if you are looking for a cheap citizenship by investment program, consider Saint Lucia’s donation option if you are a single applicant, Antigua & Barbuda’s donation option if you are a family. In the Oceania region is Vanuatu’s investor immigration program. Vanuatu is an archipelago located about 1,000 miles east of Australia. Vanuatu’s Development Support Program requires an all-in cost of $280,000 for a family of four. This is a non-refundable donation to the islands. In return, applicants receive a passport good for visa-free travel to 116 countries, including the UK, all of Europe, Russia, Hong Kong and Singapore. And Vanuatu has another big plus: No income tax levied on the islands. In October 2017, Vanuatu made headlines when they were the first citizenship by investment country to accept payment in cryptocurrency. While accepting cryptocurrency is a positive development and we should applaud the country’s leaders in embracing new technology, there is a drawback that we’ve warned about. Vanuatu is potentially setting itself up to be in the cross-hairs of illicit hackers, eager to exploit the government’s Bitcoin wallet. So, if you’re leaning towards Vanuatu’s citizenship program, it’s wise to exchange your fiat currency - rather than cryptocurrency - for their passport. You can get more details on Vanuatu’s official citizenship by investment website. You know how the rest of this saying goes. The second passport industry is no exception. If someone offers an ultra-cheap AND quick passport, hold onto your money and close that door. Again, for a second passport from a Caribbean country, expect to pay at a minimum $100,000 (plus government and processing fees). And while there’s no residency waiting period, it takes these governments a little time to process your application. In other words, don’t expect to receive your second passport within a week. Four to six months is a realistic period. A few years ago, one ultra-low-cost residency specialist in Paraguay was taken into custody by the local authorities. They discovered she had been manufacturing fraudulent visas. Unfortunately, there’s no shortage of websites claiming to have “expert information” about international diversification. But, some are nothing more than unqualified snake oil salesmen trying to make a fast buck. These sites were all singing her praises… and lining their pockets. The Paraguayan residency specialist paid a commission to anyone who would promote her services. If you find a program that seems suitable to you, make sure to find official information from the government's website that confirms the same. And if you can't find it, it's probably a scam. If you’ve found yourself asking, “where can I purchase a passport”, now you’ve got a lot more information and plenty of choices. The most important thing you should consider is your “Why?”. Only once you are clear on why you want a second passport, you can determine how much it is worth to you and decide whether you want to go the investment route. Ultimately, you’ve got to determine what’s best for you and your family. Pragmatically balance the necessary costs against your needs. Regardless if you choose a foreign residency or a second passport via citizenship by investment, you’re on the right path. Many people haven’t even considered a Plan B - a plan that ensures no matter what happens next in your home country, you’ll have options and thrive. What are the differences between the programs (number of visa-free countries, price, investment options, taxation, …). Which countries can you enter visa-free with each passport and what are their differences?. 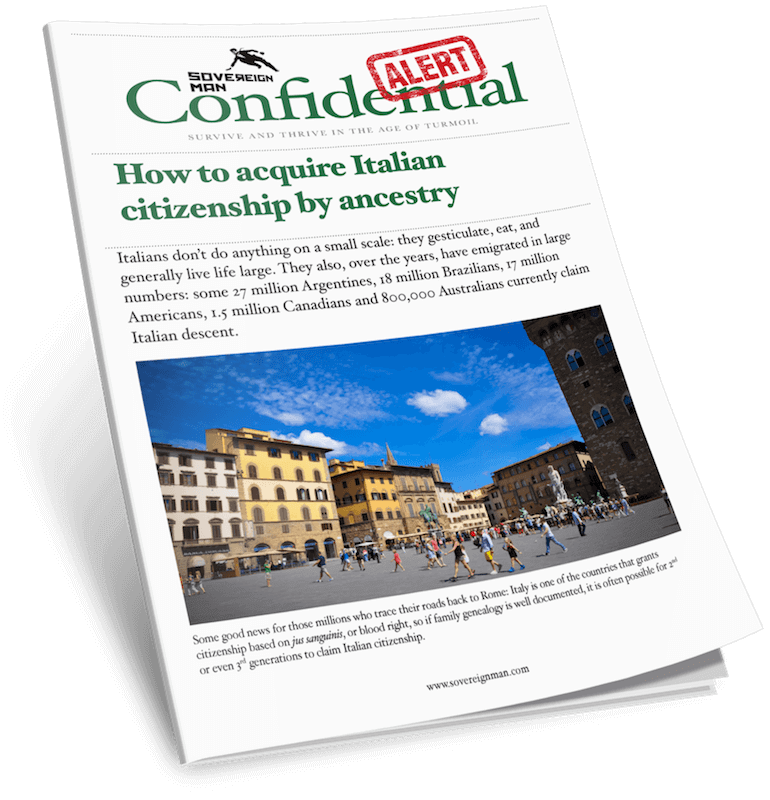 Inside this free premium intelligence you'll see how this process works if you have Italian ancestors. And even if you don't have Italian ancestors, this report is still useful to get a better idea how the process works. Step-by-Step instructions on how to get an Italian Passport & Citizenship if you have Italian ancestors. The little-known Fast-Track Shortcut that will cut the process down from years to just a few months! Our intelligence reports cover everything from new residency or foreign banking options to how to reduce, defer, or even eliminate your taxes, to incredible investment picks outside the mainstream. 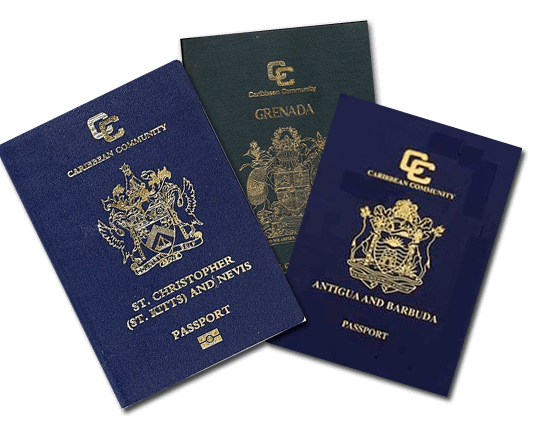 And of course, members have access to many in-depth reports on all four ways to get a second passport & citizenship. Explorer is your essential introduction to international diversification, a guide to ensure you have access to the most important tools to build your own Plan B.
It’s definitely worth your while to sign-up, and if you don’t like it, you can unsubscribe at any time.